CIRCUS SENDS 5 to NY STATE MEET VAULT PODIUM….. KAELI THOMPSON..13′ 0″ .. SHANE RACEY .. 15′ 0″ !!!! The 10 Flying Circus athletes fought their way thru the snow storm and produced super efforts in the 92 million dollar sports complex ..Ocean Breeze… this past Saturday at the New York State Indoor Track & Field Championships. The Boys Pole Vault started the day…as Ravena,NY junior..SHANE RACEY was sensational over 15′ 0″ for his 3rd place medals in both the Public and Federation standings. This humble star out of the Albany area has been solid all season and will compete this weekend at NB Nationals. Placing his first state medal in 8th place ..was senior Tommy Qualter of Clarkstown South,NY… with a new school and personal best of 14′ 6″ for Head Coach Peter Mondoferri. Just missing the podium ..was multi-star jumper..Nick Villanueva of Monroe-Woodbury at 14′ 0″ for Coaches Matt Hemmer and Jim Glover. Completing his comeback season was Washington,NY Wizard…Nick Mirecki(junior) at 13′ 0″ for Coach Mike White and Coach Stephanie Duffy. Top Soph at state was louis martinez of Wallkill,Ny at 12′ 6″ !!! The Girls Pole Vault followed at 12 noon and took place on two separate runways…. with Warwick Valley,NY senior…KAELI THOMPSON..soaring big over 13′ 0″ for her two silver medals in Public and Federation scoring. Thompson..USA#5 this indoor… has produced 12 jumps over the 13′ 0″ mark…had very close bars at 13′ 3″ with her 14′ sticks and heads to NB Nationals this Sunday at the armory. 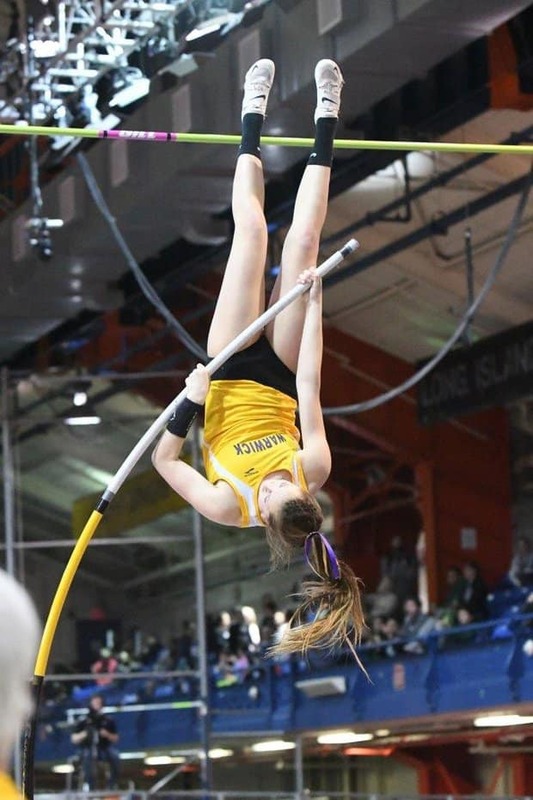 Winning her first state vault medal..was Kristen Kolarik of Arlington,NY.. with a personal best school record 11′ 0″. Monroe-Woodbury ..senior Julia Penna ..hurdler/jumper…soared over 11’0″ to equal her best and take home her dual medals. Team mate Gabby Nebiker(MW) was solid in 11place at 10′ 6″ for the Lady Crusaders!!!! WE SALUTE YOU ALL….ON TO THE NEXT CHALLENGES TOGETHER!!!! DANE SORENSEN……. FLYS AGAIN ~~~~~~ Cortland State University Freshman ..Dane Sorensen(Warwick Valley,NY) won the AARTF Conference meet this past Weekend at Ithaca College…with another personal best 15′ 9.75″ for the Red Dragons. He is now on his way to the Division III National Championships this weekend in Boston!!!! He was close at 16′ 1 AGAIN!!! Team Mate Ryan Lawless sailed 14′ 0″. Dane will be coaching at our summer pole vault camps July 8-12 and will be shooting for that 17 Footer at our CIRCUS BBQ Meet on July 13!!!! Join us for all the fun this summer!!!! In the Womens AARTF Conference.. it was Freshman…Nicole Lester (Ridgewood,NJ) of TCNJ placing 4th at 11′ 6.5″…Samantha Kaplan(New Paltz,NY) placed at 11′ .75″ Mary O’Brien (SJ Fischer) 10′ 6.75′ Julia Nomberg(Ithaca) 10′ .75″ !!!! Our Flying Circus Pole Vault Staff .. will be instructing the Pole Vault sections at THE ARMORY CAMP …at the New Balance Track Center Armory,NYC on Saturday March 23, 2019. This per season camp is for BEGINNERS…INTERMEDIATE and ELITE POLE VAULTERS…… If you are serious about learning more about training..strength development… speed ..drills and technique… the register today at armorycamp.org !!! CIRCUS CLOSED Sunday March 10 thru Saturday March 16 for Complete Recovery. We start up the VAULT ENGINE AGAIN on our regular SUPER SUNDAYS SCHEDULE March 17. Beginners Boys & Girls 11am-12:30PM Girls Intermediate/Elite 12: 30-2PM Boys Intermediate/Elite 2-3:30PM…. Cost still just $30 per athlete. COME JOIN THE MOVEMENT UP. “BIG ~ CIRCUS ~ AIR” Weekend —- DANE SORENSEN 15′ 9″ … LIAM LANDAU 15′ 6″ … ALVA SUNDIN … 13′ 1.75″ !!! CONGRATULATIONS to ALL ATHLETES who competed this past weekend of the CHAMPIONSHIP POLE VAULT SEASON. Many new stories and many wonderful experiences were shared by you all the past four months together here at Flying Circus Central. Your efforts do not go un-noticed and your spirit to reach for your very best has been inspiring to all our staff and all your parents. It’s now a short recovery period and then… time to RESET your GOALS for our up-coming Spring Track & Field adventure. THANK YOU for everything this Indoor. “KEEP the LIGHT BURNING…” !! The weekend kicked off Friday night at little Houghton College in up-state New York…with the SUNYAC Indoor Track and Field League Championships. 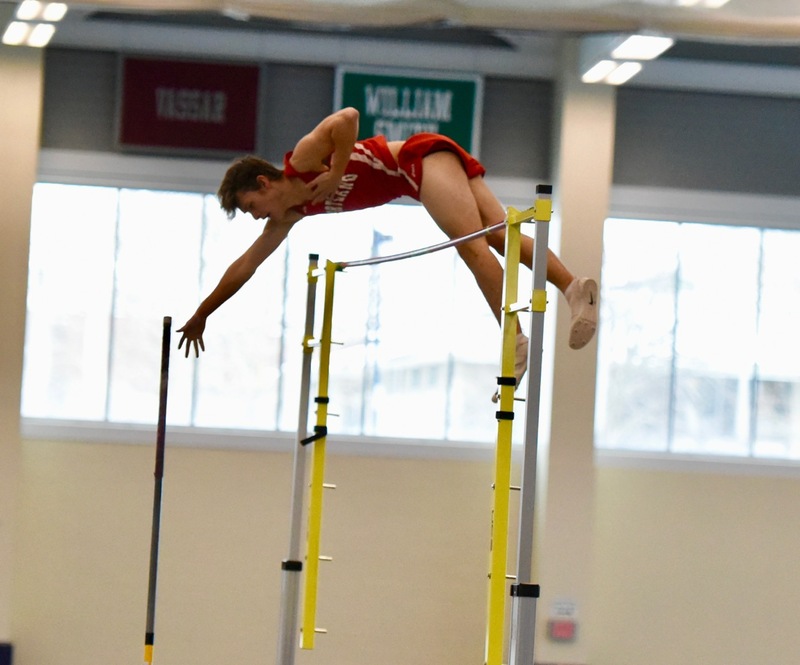 Cortland State University freshman…Dane Sorensen(Warwick Valley,NY) continued his success story this season …by winning the Conference Pole Vault title with his 15′ 9″ (4.80m) leap for Head Coach Steve Patrick and Dr.Peter McGinnis. Clearing every bar on his first attempt sealed the deal and had super bars at 16′ 1″!!! Up at Harvard University Ivy League Championships.. Former Circus star..Julia Valenti of Dartmouth won the Vault Gold with her 12′ 10 sail…. and UPENN freshman..Abby Norwillo came thru with a seasonal best 12′ 10″ for 4th place points..as the UPENN WOMEN won again the team title for Head Coach Steve Dolan/Joe Klim!!!! The New Jersey Meet of Champions–Toms River,NJ ~~~ There is joy in Pascack Hills, New Jersey!!!! Senior Multi-Athlete/Pole Vaulter won his first Meet of Champions Pole Vault title for Coach Ross Koehler Cowboys with a clean 15′ 6″ first attempt and then close at 16′ 0″ on his new pole… on to Nationals!!! Placing high(4th) was Union Catholic junior ..Conor reilly at 15′ 0″ and Callum Howald(Columbia) at 13′ 6″. The Girls were lead by Northern Valley-Old Tappan–junior..Marisa DiGia coached by Jeff Clark/Alex Eckemeyer, with a big 12′ 0″ for the silver medal. Matawan senior-Mue Carroll was solid over 11′ 0″…Jamie Rossig(Pascack Hills) tied her School Record at 11′ 0″… Hope Handlin(Union Catholic) also tied her School ecord at 11′ 0″ .. Irene Park(Pequennock) 10′ 6″. Down at Penn State Indoor Champs… Dani Heine(Abington Heights) sailed 11′ 0″ and heads to Nationals EE with more in the tank. SWEDISH JR. NATIONAL CHAMPIONSHIPS- Stockholm,Sweden ~~~ SHE DID IT !!!!! Adopted Flying Circus Swedish Jr. star..Alva Sundin…coached by the legendary pole vault champion.. Carl Alm… is now Sweden’s NATIONAL JR> POLE VAULT CHAMPION. The humble Alva used her 14′ 1 x 150 UCS Spirit to produce a seasonal best 13′ 1.75″ to win on her final jump of the meet. This two-time NYRR Millrose Games junior will be back for her final Jr. NYRR Millrose Games next year!!!!! It’s another ..Never-Give-Up Story !!! Congratulations Carl and Alva from Flying Circus!!! “BIG PURPLE” Pentathlon Meet @ Armory—- Dalton Yeust (junior) from Tunkhannock Area ,PA is a determined and dedicated pole vaulter with a dream. Dalton won his first Armory Gold Pole Vault Medal with a sensational clear of 14′ 4″ for Coach Clayton Yeust. He also brushed off 14′ 10″ for a national spot… but returns to his backyard pit this spring for more work. Tommy Qualter(CS) went big also at 14′ 4″ sB..Chris Filatov(Nanuet) 13′ 10″…Mike Alteri(Somers) 13′ 4″ Ron O(Nanuet) 12′ 4″ Jeremy Frank(Arlington) 11′ 4″. The girls winner was Emily Heese(Somers) at 9′ 6″ Hannah Solomon-Hollander(Suffern) 9′ 6″ Kristen Kolarik)Arlington) 9′ 0″. The Girls Meet rolled out 10 Circus Girls for some Fiberglass-Fun… Warwick Valley senior captain…Kaeli Thompson hit 12′ 0″ to qualify..then hit relay duty…Julia Penna(MW) set a personal best at 11′ 0″ to punch her ticket to state and team mate Gabby Nebiker is off to states next weekend with her 10′ 0″ Keira Couland-Smith(NP) 9′ 6″ Daniella Raymond(Wash) 9′ 0″ Sydnet Tomaine(FDR) 9′ 0″ Sophie Mirecki(Wash) 8′ 6″SB Violet Bachorik(Goshen) 8′ 0″SB Angelisse Diaz(NFA) 8′ 0″ Shea Ross(Wallkill) 7′ 0″. ** Will graduated from Duke University…following a senior year in high school… full of success in the Pole Vault(16′ 4″ –Still MOC Meet Record!!).. HS Decathlon Champion and Hurdling Champion. He was last years’ World Ranked #1 at 13′ 1″ Pole Vault(56 group) ~ 3rd in 2018 Outdoor Worlds Masters competition… 2nd in World Indoor Championships. !!!!! He will now turn his energy to Rock Climbing and Hurdling world-wide!!!! The Flying Circus will be CLOSED for 6 DYAS for REST & RECOVERY for all athletes and Coaches from March 10- March 16 !!!! We start the … “DRIVE for SPRING EXCELLENCE” on Sunday March 17 Regular Open Sessions! Cost $295 Registration April 1 Here ! © 2019 Hudson Valley Flying Circus. All rights reserved.